Just because you're abstaining from meat doesn't mean you can't enjoy the pleasures of outdoor cooking during the summertime. Tofu is by far the most popular (and accessible) meat substitute and is as versatile as any piece of chicken, steak or fish. This high protein, low fat ingredient is delicious prepared on the grill and pairs wonderfully with an array of other foods. When grilling tofu, it's best to use firm or extra-firm tofu so that it stays intact while cooking. Silken tofu is better for other cooking applications like soup or blending into a smoothie. Tofu is mildly flavored so it should marinate for at least 30 minutes before placing it on the grill. The marinade can be something as simple as a mixture of soy sauce, garlic and ginger. You can also slather on your favorite barbecue sauce or soak the tofu steaks in a zesty vinaigrette. Before the tofu hits the grill, make sure you have coated the grill with a non-stick spray or oil so the tofu doesn't stick. With these tips in mind, you can prepare any one of these delectable tofu recipes. If you are looking to boost your protein intake, this salad is a good way to start. Not only is the balsamic flavored tofu packed with protein but chickpeas and quinoa are a good source too. Vietnamese spring rolls are one of my go-to summer meals. Grilled tofu is tucked into rice paper with assorted vegetables, herbs and vermicelli noodles. Peanut sauce is the perfect condiment to be served alongside. Vegetarian or not, this grilled tofu sandwich showcases tofu's versatility. A block of extra firm tofu is sliced into steaks and marinated in a rich blend of soy sauce, black sesame seeds, sugar and ginger. For non-meat eaters, substitute the bacon for veggie bacon or leave it out all together. 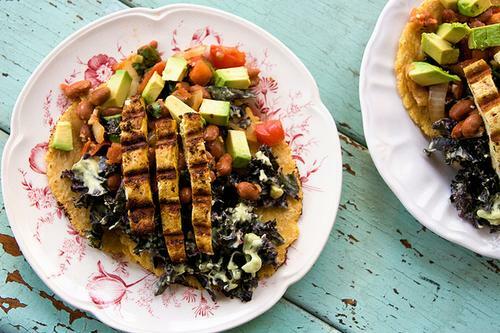 Grilled curry tofu tacos are healthful twist on this favorite summertime dish. The warm spiced tofu is served with a tangy avocado and kale slaw and pinto beans. While it strays from the classic, these tacos are definitely worth a try. Tofu and soba noodles are a perfect match. 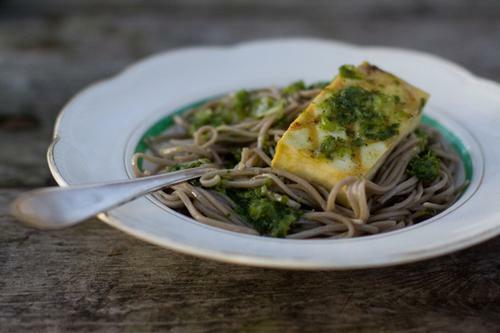 The nutty buckwheat noodles compliment the smoky tofu and turn this duo into one delicious dish. You can add some veggies for color and an additional nutritional boost.